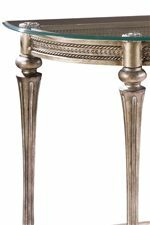 This enchanting demilune sofa table features a rounded, beveled glass top that rests on floral cast pucks and shaped, fluted legs. The table includes a rope twist and egg and dart carved apron, and a cast resin base finished in Brushed Pewter. Add other tables from the Galloway collection for a coordinated group. The Galloway Traditionally Styled Demilune Sofa Table with Beveled Glass Top by Magnussen Home at AHFA in the area. Product availability may vary. Contact us for the most current availability on this product. 37515T Demilune Sofa Table Glass Top 1 50" 18" 1"
37515B Demilune Sofa Table Base 1 46" 13" 29"